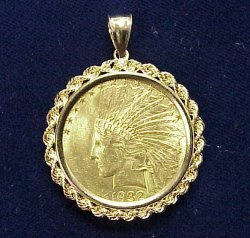 U.S. $10 Indian Head Eagle Gold Coin in our 14K Rope Bezel! 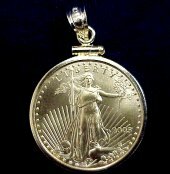 One of our best sellers!...The U.S. $10 Indian Head Gold Eagle coin is in wonderful brilliant uncirculated condition (date of our choice) and comes mounted in our solid 14k gold rope bezel. 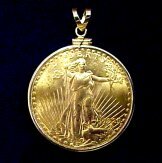 U.S. $10 Liberty Head Eagle Gold Coin in our 14K Plain Bezel! Fancy $10 U.S. Liberty Head Gold Eagle Coin... The early gold eagles of America were minted from 1839 until 1907 when the new Indian Head design was passed by Congress. Each coin is in brilliant uncirculated condition and comes mounted in our best solid weight 14k gold bezel and ready to wear! 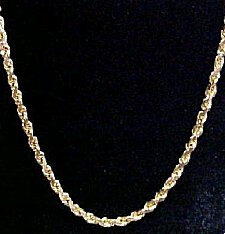 Diamond & American Eagle Gold Coin Pendant... Check this out! We have taken the 1 oz. (22kt.) 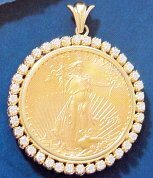 American Gold Eagle coin and mounted it in our best quality 1.0 carat fine diamond bezel made of solid 14k gold and have it ready to wear! 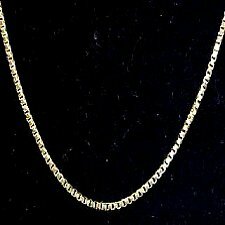 Quality Solid 14K Italian Rope Gold Chain Necklace! Hot new 1/10 oz. 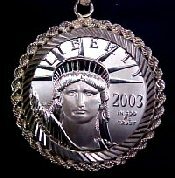 Platinum American Eagle Pendant...Each coin is a first strike and comes mounted in our best quality PLATINUM rope coin frame. Other coin weights available upon request---please call! Hot! 1/4 oz. 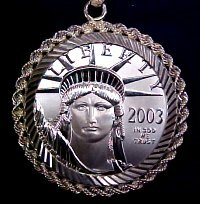 Platinum American Eagle Pendant...Each first strike coin comes mounted in our best quality PLATINUM rope frame. Other coin weights available upon request---please call! 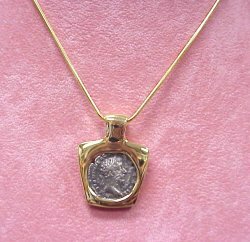 Early Roman silver coin...mounted in our custom 14k heavy bezel. A real treasure. Please call for our best price!